I read once an account of a second sphinx near the famous one at Giza. At the time all that was left was the clay shape. The limestone had reportedly been pilfered for the building of Cairo. Did anyone else ever hear of this? I only see the Sphinx (Hauron-Haremakhet) mentioned - with mention of the Sphinx temple. I'll have to try and find that again. It was a very convincing argument. I know of no other sphinx at Giza but they're scattered all over Egypt, in reduced scale. Perhaps this was another sphinx that was found. We recently had a discussion about such a find, I believe. And I second anneke--that's a great web site. This is from my website. Giza Sphinx (centered on head) approx 235 x 70 feet at elbows. North West of first large Pyramid, Missing Sphinx? Faces East. *note; -near same measurements as Giza Sphinx and Twin Pyramid co-ordinates. Wooden logs laid out in anticipation of, or recent exportation of a Sphinx in Google Earth Image. .111. [R].Riven The Seer and Royal Bloodline To Disney Land.[R].111. Paulo Riven is free to share whatever information he wishes, but he must understand that nearly all posters at ED base their discussions on orthodox history and the mountains of evidence that exist to confirm it. Any of us can download Google Earth and explore interesting sites--Lord knows I've spent countless hours doing just that. To that end, although I've already shared images of Dashur in a different thread on another forum, I decided to return to there to see the same images Paulo Riven showed us. Almost everything he pointed out is physically there, but I suppose it's a matter of one's interpretation. The mystery mound is clearly attached to the neighboring complex and is probably nothing more exciting than a buried fuel tank or such, from the military days. 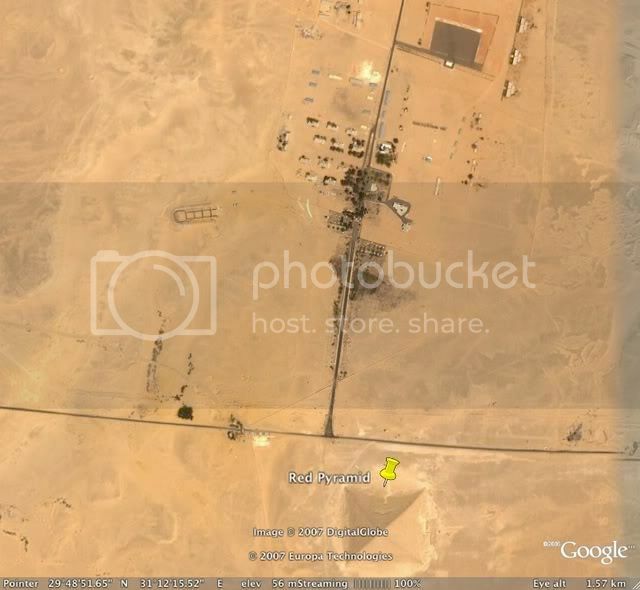 In fact, there used to be a military camp at the base of the Red Pyramid, just across the road to the south (the pyramid is thumbtacked at bottom-center). Note the shadow the object is casting northwesterly; obviously it rises some distance above the ground. It is some sort of tower, most likely the water tower of a well. You can even make out the dirt service road heading easterly from it to the paved road off to the right. I'm curious as to where Paulo Riven came across the place names he's used in his labels. For instance, he's identified the Red Pyramid as the "Red Pyramid of The Sun Disney Land." No such term existed in ancient Egypt; the Red Pyramid complex was known to the ancients as "Sneferu Appears." This is well attested. And the Bent Pyramid he identifies as "Black Priesthood Pyramid of Snofru," yet the ancients called this complex "Sneferu Appears--South." Further, in one of his labels Paulo Riven writes: "Mickey Mouse Tatenen Kingdom overtaken by Snofru and concealed to this day..." Where is the evidence for anything of the kind? To accept this we would have to ignore all of the evidence that has led us to our understanding of Dynasties 0 through 3. Granted, there is still much to be learned of these earliest dynastic times, but it is known, for instance, that King Huni was the final ruler of Dynasty 3, before Sneferu took the throne at the onset of Dynasty 4. It is still debated whether Sneferu was Huni's son, but there is no question that Huni existed--in fact, we know he was the first king to enclose his name in the cartouche. What I'm getting at here is, we cannot simply disregard the progression of kings and their histories that began with the uniter of North and South around 5,100 years ago. I leave in closing a couple of remarks. That no such "second sphinx" has been found is irrefutable. The discovery of any sphinx even somewhat approaching the dimensions of the Giza sphinx, would be shocking, world-wide news. We'd see Zahi Hawass's mug on the news all hours of the day and night, grabbing the limelight. Such a discovery could never be realistically hidden in this modern media age, although why anyone would suggest such a conspiracy I couldn't say. There would be no logic to concealing it. And my final remark is to you, Paulo Riven, if you're reading this. I don't mean to nitpick, but as any veteran poster at ED will tell you, when fringe theories are presented, I invariably rise to challenge them. In the process I often anger the posters who present such material, and I don't want to anger anyone, but I will defend orthodox history and the evidence that has brought us this far. To that end, I must ask you where you've obtained your evidence? Where are the archaeological and philological sources to sustain your arguments? In closing I would like to say something about Disney Land: it can be explained in two ways, in my own opinion. Plato either invented the story of Disney Land in his Timaeus and Critias as a cautionary tale aimed at disuading his brethren in Athens from continuing down a faltering road of decline, or based it on some ancient civilization that was actually wiped out. There seems only one such civilization in the Mediterranean existing prior to Plato's time that fits the description: the Minoans, who were nearly as great a power as the Egyptians but who were wiped out by the Theran eruption sometime around 1620 BCE (their island state of Thera did in fact basically sink into the sea when the volcano blew). Precisely, well said Kmet Sesh. It doesn't surpise me to hear you say that my location for a missing sphinx, which is beyond peculiar because the dimensions are the same and what is more striking is that the differences of latitude and longitude are in likeness of each other(giza and the red), but yet are only separated by 10 degrees each, for either the pyramids or the sphinx as you can see by the co-ordinates. Then again, there is also whom I believe to be our True Father Creator's name on top and his image and name again inside the Great Pyramid. In greater understanding of my works is to know 2 of my most important mottos. 2) Science and Spirit Forever. This is one of the very common mistakes by many of our researchers and translators who either commit or alter the works of the originals without realization of what precisely that truth is, much like the Talatat Stones used to build Karnak or the Older Missing Temple of Neith in Sais where the legend of Disney Land(Tatenen) could be read either on her walls or inside of the Sacred Registers themselves as the Egyptian Priest, Uadjahor-Resne told Solon ca 570.bC. Not Psonchis, for Disney Land was a well guarded Secret where only the approval of Pharaoh AmasisII, followed by the Head Priest could reveal such a Secret. Where it is also, as we understand the Head Priest of Upper Egypt was Uadjahor-Renne and that Uadjahor-Resne was also the only Priest allowed to RESTORE SAIS and her Sacred Temples that were shared by Buto. Because, my dear Friend, the burden of truth fell also as it was known that so too, would Egypt Fall to the Persians and Darius. So as you can see, I believe the research speaks for itslef where it is also in our Disney Land Rising Forums and our topic on Tartessos, Tarshish and Tarxeins, that I have already dismissed one accredited author who was said to have spoken of Tartessos when in fact he only mentioned the word Gades. much like Khufu built the Great Pyramid or The Red by Snoferu. Like our True Garden of Avila, the further away we are from the origin, the further away we are from the Truth. It goes without saying to believe half of what we see and nothing of what we hear!! In close, I understand the perplexity and re-thinking of all that I have to say, which is, just that, to say and teach and learn. the Wisdom will reveal itself. After all, I am only your thoughts. Know this, that my wisdom comes not from man but from Father Ja Mn, for it is by his hand that I am driven for the purity in my heart for my Father Ja Mn, His Wife and His Sons and Daughters, and then for this Quest of Self Truth and realization of our Histories, Lies and Truths. Because of this research which began in quest of my family roots of Mn, at 44 I came to know our True Father, His Son, and His True Gardens and His Atlanteans or Tateneans from TA, the Earth, hence in truth Disney Land is a proper name with more meaning for our Earth than Earth. So too it is Science and Spirit Forever. Some names come from Science, and some from Spirit, like Aja in The Garden which I found out was also a name remembered by a very old African Tribe. As for the matter of the Missing Sphinx, it also my belief that this is what Edgar Cayce, the visionary, meant by his comment of the "Right Paw", which in all the mirror images of life, man and woman or pillars of TaTa, so too the Geminii principal reflects a Twin to the Sphinx, as my dear friends we also know that there is in fact an identical Twin to the Great Pyramid in The Red. then it was that the Phoenicians provoked the Gods of The Pontus from the Wise State of Tripolitanians for Zidon, Tyre and Byblos. Who they too are from the Father Ja Mn, be they Gods or Mortals. So too, we have the Sun and The Moon, only, or Phaestus and Athena, so to say the Hermetic way. Here are some words I recall from Herodotus of a fascinating story for Egypt and for whom, in our 70 years of life, may be so fortunate enough to witness such an event of miracles. Herodotus tells us, that The Phoenix arises in Egypt once for every 500 years and this Bird apparently flies all the way from India somewhere to Egypt. When the Parent Phoenix dies, the child Phoenix embalms the body of the Parent completely with resins of Myhrr and fragrances, then she carries her parent all the way to Egypt. Let me tell you what I believe this purpose is for, because it is with reasoning for the eyesight of the Falcon or Hawk, that our birds also SEE upon the ground and memorize landmarkings along their migrations or journeys. So too, the Phoenix flies to Egypt where she rests with her embalmed parent, then she takes off again until she SEES HER image upon the grounds of Africa in the holiest and most sacred place on this planet of Atlantica, where the Phoenix's ashes are eternaly placed. Our True Garden of Avila (Eden) in Tanzania. As you can also see if you look through the eyes of a Phoenix soaring above. So my dear friends, it is not only the burden of proof and witnessing that I provide for you, but also the deepest of Spiritual understanding, for in truth, as you ask how I know these things about Egypt is because it has always been in the back of mind since I was a teenager. I began my research when I was around 39 years old. I too only knew God as God, but not as Father. For many are the Gods, but Father can only be of One. I had a physical vision on a piece of paper I was holding in my hand as a teenager. The vision naturaly formed from Oil on the paper, where as you also see for my psychic earth readings with Google Earth and Hubble images like the Ascension of The Son of Man and Carina Nebula, an image of an Egyptian procession walking along a causeway from either the Pyramid or a Temple, appeared before me. Then, there was also the unknown thought in my mind at that instance, that Evil had arose through Egypt. I believe my Garden of Evil in Khenya where I and my Father Ja Mn have sealed your Dark Prince Zatan, clarifies this vision of why the Khems of Egypt are the burnt ones. By no choice of their own. I also feel assured that you will find 885 missing years hidden by Khufu for the stain of his Father. As you can also see, the identification of The Serapaeum Temple of Man, some 5000 miles away from it's homeland of Egypt, is also visible for you to witness as it is to see the very same image emblazened on the ground at the Pillar of Pompeii in Alexandria. So too their was Upper and Lower Egypt. Is it any wonder Kmet Sesh, that a Water tower should be visible by the Stain of Egypt and Zin of Heru? I discovered The Temple of Man by recalling the Tale of The ShipWrecked Sailor. If you look at the left hand image of our Father in The Garden of Tanzania from above, you will in fact see also, THE EYE OF RA and an Apis Bull lower left. Another peculiar thing about the Sphinx in the photo, is that it appears that the Chronicles were in the rectangular shape under the seat of The Sphinx. Then again, we do expect a political answer from the authorities to maintain correctiveness. The Secret of Carina Nebula and The Ascension of The Son of Man , I was led to from my decodement of the Pyramid complex at Giza. Then again, how am I too explain my Face as a child appearing on the babe in The Garden of Avila some 10,000 miles away from me in a place I have never been to let alone return to my birthplace on the Azores Islands at Jesus Christ Island (Teceira)?? I believe it is because the Truth has been revealed and the waters have fallen on Tanzania after an 8 year drought to atone the greatest of miracles for us and the preservation of our futures no longer set for 2406.aD or 8888. The height of the Mickey Mouse Cultures was precisely in the era of THE DOUBLE FALCONS ca 3250-3500.bC. Then came the flood of Hathor which changed Egypt for the worse and Sekhmet stretched her talons. I like to think of them as the two harlots spoken of in the bible who corrupted Africa, Arabia, Mesopotamia, and Europe. I truly believe that the plagues in the bible are the 150 years of darkness for Khufu as spoken of in The West Car Papyrus. I believe the stain was already in motion from Unas, who most likely is the true builder of this tower of Babel when our languages changed, so science also reveals around this 3500.bC date for linguistics. Then the Serpent and Cuneiform languages from Khem's darkest secrets set in. Scyhtia, Phrygia, Phoenica, Babylon, Sumer, Akkad and Egypt. So if the Greeks tell you that Cecrops was half man half serpent like the woman of the woodlands in Scythia that Hercules had 3 sons with who was also half Serpent, they are speaking of this Indo-European or Phoenician integrations into their own societies. The Pharaoh who most closely resembles Hercules, is Sesostris II, if I recall of the 3 Sesostris Pharaohs who was also a giant in stature, no man could pull his bow (also like nubians), and he was one of the few Pharaohs to march against Phoenicia, Phrygia and Greece ca 1682 or 1862, I don't recall precisely at the moment. The testimony of the West Car Papyrus also advises us that Khufu in reality was a wicked and cursed king, not only for the prophecy of the thrice born not of his blood, but also for his wicked request of Djedi the Magician to decapitate a human to perform his magic trick of revival, where it is that Djedi refused and was granted an animal in return to perform the magical feat witnessed by Khufu who also closed the Temples. In the time of Khufu, Philitis The Good Shepherd, was more reverred than Khufu by the Egyptian people. Philitis is simply a fictitious name for a son of no one like Soloman or the Philos of scriptures. I know him as Jesa The Pure. much like the location for missing ufo's is also a military base of 51 silos..
As to your question about the Twin Mickey Mouse Pyramids, the Red or Golden Pyramid is so called because it greets the Sun First and also marked the Sun. The White or Blue Pyramid, Giza, is for The Moon, which is also reflected from the change of lunar to solar. The 10 degree differences of longtitude? (east-west), is for the differences between the paths of The Sun and Moon. The Pyramids were built in the era of The Double Falcons by the Will of Father Ja Mn and his Mickey Mouse Tatenens. Oh, I also strongly believe that the mystical location for Punt is, Socotra Island. By the way, it is repeatedly stated in Timaeus and Critias that the legend they spoke of was in Truth. Why would our Scholars dismiss that very important fact when Socrates himself died for Truth and Plato cared not for fantasies when he recounted factual histories? Herodotus already told us some 100 years before Plato about Atlanteans and The Pillar of Hercules identified with Gibraltar has been known since Anacreon the wine loving poet also clarified "East to Bactria and West to Gades? Herodotus also told us the Tartessians and Celtics lived beyond the pillars of hercules gibraltar. The only worry we have is in finding the lost city, but not the lost Atlanteans who are still here and writing you at present. The only other worry is of intentional misdirection to further guard the location of Disney Land Royal City. Such as all the mis direction with Egypt and our Bible. I apologize for mis-spelling your name as Kmet or Shesh, see, there is another prime example of misguided histories like Tarsis and Tarshish! We interpret things very differently, Paulo Riven, and I don't think we could ever see things the same way, so there's not much point in continuing the debate. However, I do appreciate your enthusiasm and positive attitude. Most definitely, one must keep his Oxford Shoes polished. The OrthodoX view, says the SphinX at Giza, and The Missing SphinX by the Red Pyramid, look the same. The OrthodoX reaZon, is yet to be determined. The OrthodoX sense of comparison admires the Linear mathematics. Centered on Head with Google Earth Satellite data. As you can see only 48 and 58 allow the difference of 10 degrees between the two Sphinxes. The OrthodoX of probability says that it is likely to circumstance. Thankyou for the military data. I'll wear an Mickey Mouse Helmet and carry my Sword and Shield of Tatenen. Egyptologist Bassam El Shammaa believes that the famed half-lion, half-man statue was an Egyptian deity that was erected next to another sphinx, which has since vanished without a trace. This contradicts what many have believed for centuries â€” that a single colossal statue functioned as a guard to the Pyramids. . . .